All of your FAQ’s answered here! Know what to expect before you come to the studio. If any of your questions haven’t been answered feel free to give us a call! For all classes, please bring your yoga mat, water bottle and wear clothes you can move in. Tennis shoes or sneakers are recommended for cardio, dance, and strength training classes. Please arrive 10-15 minutes before class. 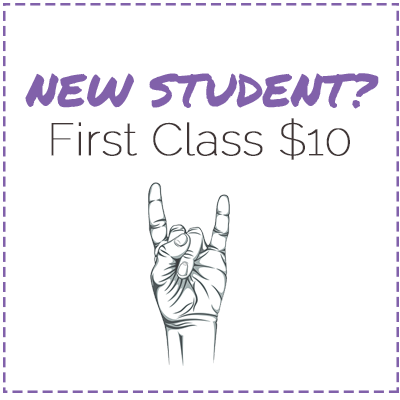 Keep in mind that our classes run nearly back to back so if you get in early, you might run into a class already in session. Is it easy to park near the studio? Yes! There is plenty of parking on Grand Ave. Please remember that there is parking restrictions during the week on the south side of Grand between 7-9 am and the North side of Grand between 4-6 pm. Do you have mats available? Yes! If you forget your mat, you are welcome to use one of our mats for free. Can I store my mat at the studio? Of course! But please be sure to put your name on it. No, but please just arrive at the studio 10 to 15 minutes prior to sign a waiver, tour the studio, and pay for class. We also offer the option to sign up in advance for class using the MindBody scheduler at the bottom of our homepage. Can I pay online or at the studio? You can pay for a drop in or class packages when you come to the studio for this class or you can sign up/pay in advance using our MindBody scheduler at the bottom of our websites homepage. How can I keep up to date with all things Through The Body? We often hold social events, add classes and share fun news from the neighborhood with our community. You can sign up for our newsletter or follow us on Facebook. Can I show up late for class? We will allow you to show up 5 minutes after class has started, but after the 5 minute mark you won’t be allowed to take class. Showing up late risks injury to you since your body hasn’t had time to warm up. It’s also out of courtesy to others in class not to show up late. What does a monthly membership include? A monthly membership at Through the Body gets you unlimited classes, plus discounted/free admission to our events & workshops. Our monthly unlimited membership requires a 3 month commitment, you can cancel your membership anytime after the 3 months is up. In order to cancel, we require a two weeks notice from the date you wish to cancel your membership.